If you're looking for an anti-holiday show in this busy #TCTheater holiday* month, a little bitter to balance out the sometimes overwhelming sweet of the season, look no further than Ibsen's masterpiece A Doll's House. Orchard Theater Collective is making their debut with this piece, and they wisely partnered with #TCTheater favorite Craig Johnson, who adapted the play into a crisp 95 minutes and directs this talented young cast. Taking place in Norway during Christmas of 1879, what's remarkable is how ahead of his time Ibsen was in revealing the difficulties that women faced (and still face) living under the strict and unfair rules of society, and how much this play still resonates today. 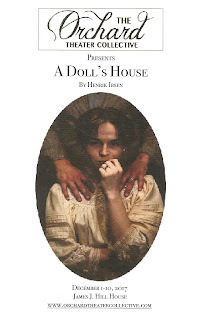 I'd never actually seen A Doll's House, just a couple of adaptations (including the 20th Century set Dollhouse at the Guthrie in 2010 and this bizarro one, also at the JJ Hill House). So I can't tell you what was trimmed** to fit the story into 95 intermissionless minutes. But I can tell you that it feels a full and complete story with nothing missing. Nora thinks she's living the perfect life with husband, home, and children, until it all comes crashing down around her when it's revealed that eight years ago she illegally borrowed money to save her husband's life. Her husband Torvald treats her like a doll, calling her his skylark or songbird, but the moment he finds out that she has been living a life that didn't conform to his ideas of her, he rejects her (see also: Victor Newman). Nora takes desperate measures in order to save herself, to live her life as a human being first, rather than just somebody's wife and mother. The Orchard Theater Collective is a group of recent U of M/Guthrie BFA graduates, four of whom appear in this production. The Guthrie trains its students well, as evidenced here. Mackenzie Shaw is a wonderful Nora, believably transforming from giddy and flighty, to desperate, to a woman determined to reclaim her life. Damian Leverett is a smooth and charming Torvald, revealing the darkness underneath. 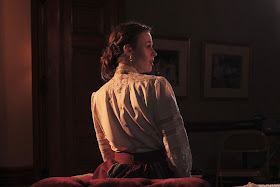 Anna Leverett is strong as Nora's friend Christine, on a journey of her own, and Ben Shaw gives a nice turn as Krogstad, the man from whom Nora borrowed money who now desperately tries to blackmail her. Rounding out the small cast are non-company members Diana Jurand as the maid Helene, and Antonio Gonzalez-Luna as the warm-hearted but doomed Dr. Rank. 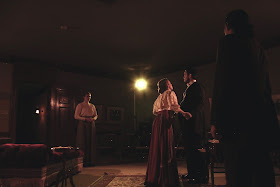 The play is performed in a former school room on the third floor of the James J. Hill House. A small room dominated by a beautifully lit and decorated Christmas tree, with just two rows of chairs on either side of the performance space in the middle. This intimate setting makes one feel as if one is right in living room with Nora and Torvald. There's nowhere for the actors to hide, and they all give very real and believable performances, up close and personal. There's nowhere for the audience to hide either, right there in the thick of things. The beautiful period costumes (designed by Carolann Winther) also stand up to close viewing, gorgeous dresses and sharp suits. Only four performances remain of A Doll's House, two more this weekend and two next weekend. Although told through a male playwright and adapter/director, Nora's story is very much a feminist story, a woman's story, and one that still needs to be told, and is beautifully and effectively told by this new young company. **I can't tell you what was cut from the play, but director/adapter Craig Johnson can. See comments below.